Come to our open events! Calling all parents and carers! Please join us at the Didsbury High School Open Evening on Thursday, September 27 from 6.30pm (doors open at 6pm). The event is taking place at Laurus Trust founder school, Cheadle Hulme High School, Woods Lane, Cheadle Hulme SK8 7JY. Come along and find out all about Didsbury’s exciting new high school, meet the teachers, hear from Head of School Dr David Woolley and ask any questions you may have. We hope to see you on the 27th! These two-hour events aim to help you to make an informed choice if applying for a secondary school place by 31st October 2018. 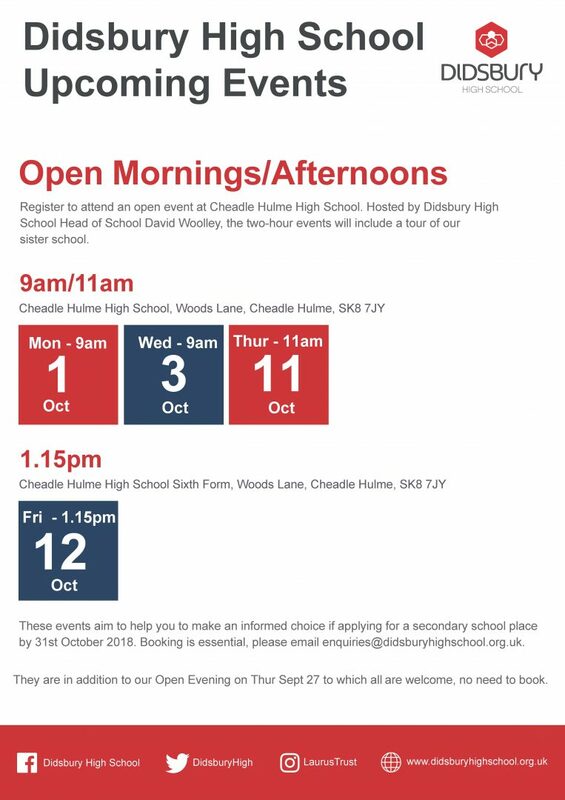 Unlike the Open Evening booking is essential, please email enquiries@didsburyhighschool.org.uk. Admissions for September 2019 entry to DHS close soon! The Laurus Trust is a limited company registered in England and Wales with company number 7907463. The registered office is Cheadle Hulme High School, Woods Lane, Cheadle Hulme, Cheadle, Cheshire SK8 7JY.